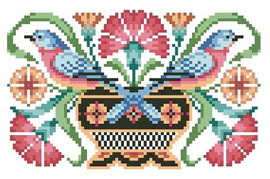 Sandy Orton designed this delightful geometric carnation sampler with a folk art flair that will look good in any décor. It makes a beautiful pillow when stitched on large count fabric and is lovely repeated as a border. Contents: Stitch Count 89w X 56h, Finished size on 14ct: 7" x 4"